The UAE's Abdullah Humaid Al Muhairi with his speedy mare, ‘Cha Cha Cha 7', was crowned the cup of Grand Prix during the second edition of H.H. Sharjah Ruler Cup International Show Jumping Championship (CSI5*W). The four-day event that was held in the indoor arena of the Sharjah Equestrian and Racing Club, ran alongside an international two-star championship (CSI2*), as well as a young horses' category for horses between 6-7 years old (CSIYH1*); a children's category for 12–14-year-olds (CSIOCH); a junior riders' category for 14–18-year-olds (CSIOY); and a young riders' category for 16–21-year-olds (CSIOJ) that made up the finals for Group VII. The main championship included the finals of the Arab League qualifiers for the Jumping World Cup, and the names were announced of the three Middle East riders and two North African riders who will participate in the Show Jumping World Cup that will take place in Sweden in April. The three Middle East riders who qualified are Saudi's Ramzy AL Duhami with 67 points, the UAE's Abdullah Humaid Al Muhairi with 57 points, and Saudi's Khaled Abdulrahman Almobty with 53 points. The two winners who will represent the countries of North Africa in the World Cup are Egypt's Abdel Said with 65 points and his compatriot Mohamed Talaat with 52 points. The CSI5*-W H.H. Ruler of Sharjah Cup - Presented by Longines consisted of two rounds with a course designed with jumps ranging between 145 160 cm. 44 riders participated in the competition, 11 of whom succeeded to move to the second round, all with no faults, except one rider who had only one fault for exceeding the allocated time of the first round. 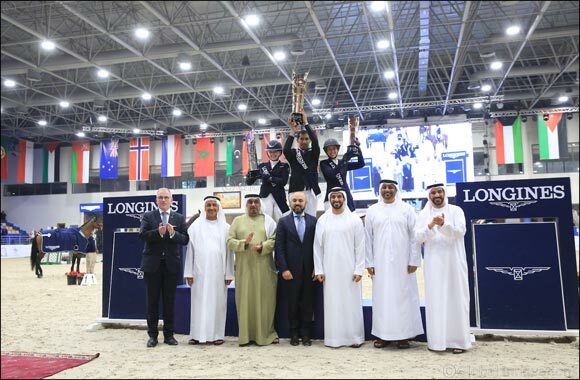 Abdullah Humaid Al Muhairi presented the best performance in the second round and completed atop ‘Cha Cha Cha 7' with a time of (43.12) seconds, securing him the championship cup and enabling him to qualify as one of the top three Middle East riders to go to the Show Jumping World Cup. The Swedish rider, Evelina Tovek, and her horse ‘Dalila De La Pomme' won second place by finishing the round in a competitive time of (43.78) seconds while third place went to Swiss rider, Janika Sprunger, and ‘Bacardi VDL' who finished the round with a fraction of a second difference from second place, registering (43.79) seconds. Sheikh Abdullah bin Majid Al Qassimi, Chairman of the Sharjah Equestrian and Racing Club and Honorary President of the Championship attended the event and crowned the winners alongside Sheikh Sultan bin Ahmed Al Qasimi, Chairman of the Sharjah Media Foundation, Head of the Sharjah Government Media Office and Head of the Championship; Dr. Ghanem Al Hajri, Secretary General of UAE Equestrian and Racing Federation; Sultan Mohammed Khalifa Al Yahyai, Director of the Sharjah Equestrian and Racing Club and Director of the Championship; Patrick Aoun, Regional Brand Manager of Longines - the sponsor of the Championship Cup; John Roche, Director of Jumping at the International Equestrian Federation (FEI); and Stephan Ellenbruch, Chair of the FEI Jumping Committee. At the end of the coronation ceremony, Sheikh Abdullah Al Qassimi said: 'We are honored to present this achievement to His Highness Sheikh Dr. Sultan bin Mohammed Al Qassimi, Member of the Supreme Council and Ruler of Sharjah. It is thanks to his guidance and support to the Sharjah Equestrian and Racing Club and its riders.” He also thanked the audience that came out to watch and all the guests and committees that worked hard to make the championship successful. He blessed the victory of Abdullah Humaid Al Muhairi and all the Emirati riders. For his part, Sheikh Sultan bin Ahmed Al Qasimi dubbed this victory as a proud achievement for not only Sharjah and the Board of Directors of Sharjah Equestrian and Racing Club, but for to the entire UAE. He said that taking this championship to this level is proof of the great potential that Sharjah has in all administrative and technical aspects. He finally thanked His Highness Sheikh Dr. Sultan bin Mohammed Al Qasimi, Member of the Supreme Council and Ruler of Sharjah, for his support of all Equestrian activities and their riders.